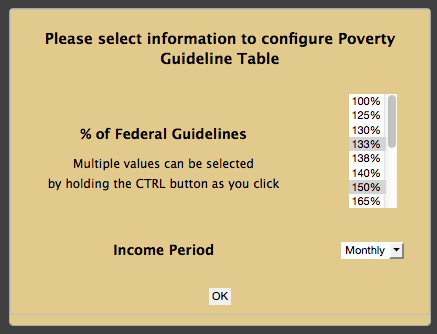 A module which embeds Federal Poverty Guildelines tables into Drupal WYSIWYG pages from easy-to-use selection popup, available from Editor buttons. For Drupal 7, CKEditor. Tables are loaded from a script which gets base guideline data from the most recent source so that tables are always uptodate, without having to re-edit the pages.